I didn’t plan to make this cocktail at all. The plan was to make The Aviation Cocktail; I thought a pretty purple cocktail with a bright red maraschino would be perfect for a Valentine’s Day cocktail but unforeseen circumstances saw that change only after I had setup the entire shot. What happened? Well, son of a gun I had the wrong Luxardo! What I wanted is a clear liqueur, what I had was sort of reddish brown…big difference. So that one will have to wait and I had no choice but to punt. The Blue Moon is basically the same ingredients as The Aviation minus the Luxardo liqueur and makes for another great cocktail. My only other experience using Creme de Violette was when I made this cocktail during an Icelandic Festival in Denver. That cocktail used Reyka Vodka from Iceland and I was scheduled to meet the owner for lunch today while he was in town. Maybe he’s the one who brought this blasted cold with him…this morning it was -25 with wind chill when I put the dog out; seemed almost cruel it was so cold! As luck will have it lunch is cancelled and it’s because of a cold, not the cold. I’ve done my best to ward this off when I felt the first signs. Vitamin C, salt water gargle, Airborne to boost my immune system. Usually works but this one is tenacious and I’m sitting here; late with this post, sniffling, shivering and wanting to go back to bed. I could call this cocktail a medicinal libation right and take it with me? After all is said and done…there is some irony that I liked the Blue Moon better! The Luxardo is sweet and I don’t think necessary. I enjoyed the combination of lemon, gin and violette. The violette is subtle but a nice floral hint that I enjoyed. Plus it’s prettier. Truth is even adding the lemon juice changed the color. Seems the only way to see a bright lavender, clear drink is to take a photo prior to those additions but I would rather give you the straight skinny; it’s good and it’s lovely but it’s not a pure bright purple cocktail! 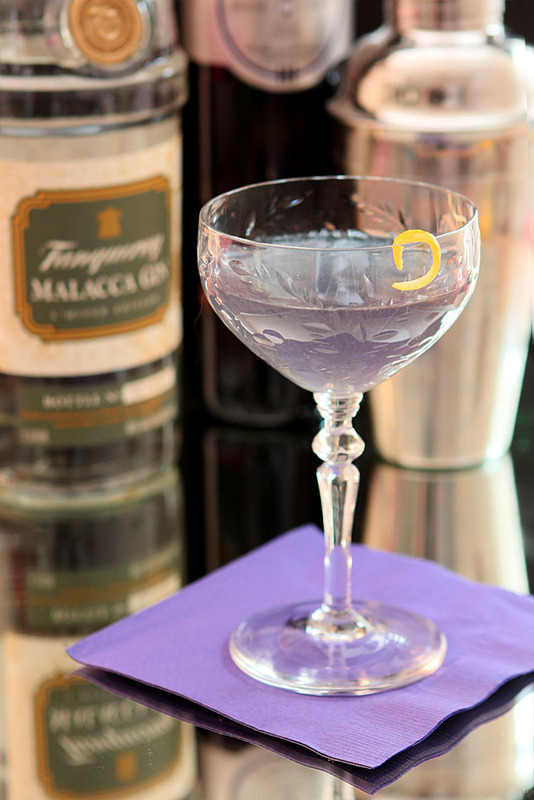 Over the holidays I was gifted with a bottle of Tangueray Malacca Gin; I didn’t know until I decided to use it today just how lucky I was. Malacca was discontinued in 2001 after being introduced in 1997. Despite that early demise it it had built up quite the cult following and as a result it’s been brought back into production, fueled primarily by the craft cocktail movement and the bartenders behind it. Distinguished from London dry gin, it’s more similar to a style called Old Tom gin; less botanicals, not as dry and a bit more citrusy; I thought perfect for using in this cocktail. Now it’s in high demand but also it’s limited in supply. Definitely worth trying if you can find it. Now I’m off to bed…Achoo!! Add all ingredients except lemon twist to a cocktail shaker filled with ice. Shake until cold and then strain into a coupe or martini glass. Where did you get that glass? It was a super find at Goodwill. Always hit or miss and that day it was a big hit! Shake all ingredients with ice to chill and strain into a chilled glass. Garnish. I love the recipe, it will be a great alternative for my dinner party plus it will also go with the theme of the dinner party. Thank you…hope your guests enjoy it too; it is a lovely cocktail. This is one of the prettiest drinks I’ve ever seen! 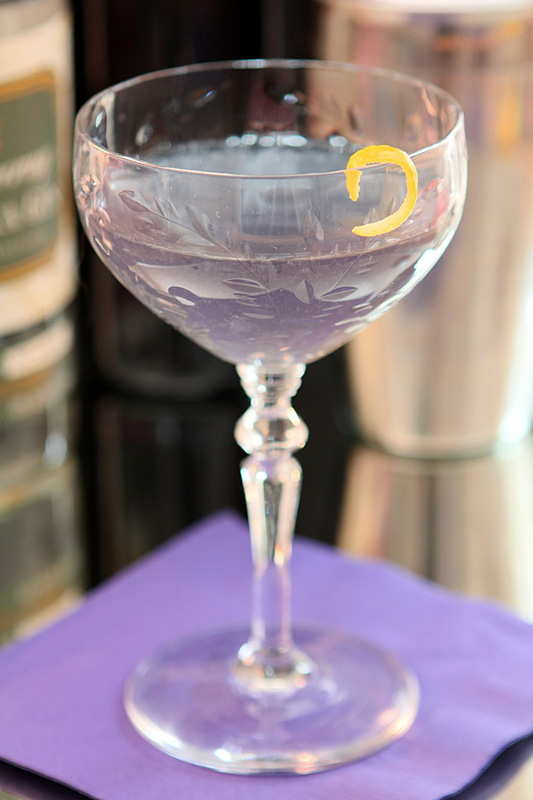 I have a large bottle of creme de violette in the cupboard…I made one aviation and that was it. Glad to find another use for such a stunning liqueur. Isn’t it just gorgeous Sue…although I’ve always loved purple! Wish I had a sip of this. Thanks for posting the recipe. Hi, this looks so pretty and I am sure it is refreshing. I have had a hectic day today and would really enjoy this about now. I just read your ‘About’ page and you sound so talented and accomplished, kudos to you! Feel better soon, Barb. Drink a few of these beauties and you’ll be better in no time! Sorry to hear you’re under the weather but few of these cocktails might make a difference. 🙂 This cocktail is so pretty. Thanks Maureen. Colds are weird; they never sound like much when you hear someone has one. Then you get one and remember how miserable they are. Wish I could drink but not while I’m taking drugs. Doggone it! Hope you are feeling better soon. I could use some healing, too and I don’t care weather it is chocolate or this drink. Both sound equally enticing. But I do have to agree that this is a pretty color and I’ll bet it tastes great, too! I have got to come meet you before the in laws come in for their 3 month long visit and before I get way too busy! Sorry to hear about your cold! I hate being sick. Anyway, the Blue Moon is a great cocktail! And I came awfully close to doing it myself for my monthly cocktail! You did a great job with it — wonderful pictures. But Luxardo Maraschino liqueur shouldn’t be reddish brown — it’s totally clear (unlike the syrup in the Luxardo maraschino cherries bottle, which is distinctively brown). I wonder if you have a bad bottle by chance — or maybe they have a couple of different kinds? Mine comes in a straw-covered bottle. Maraschino liqueur isn’t something that I use all that much, but I have purchased several bottles of it over the years — all the Luxardo brand — and the liqueur in each one has been clear. And I just checked a bottle I have in my liquor cabinet to make sure I wasn’t delusional — totally clear. Which doesn’t mean, of course, that’ I’m not delusional anyway. 😉 I’d talk to your liquor store about it — it doesn’t sound like you got what you should have. Anyway, great save with the Blue Moon! What a wonderful cocktail. There must be other varieties of the Luxardo brand; I want to find one now! Look for that in your liquor store — you’ll love it! Would you be completely surprised if I told you I already bought it? Didn’t think so. I mean sick as a dog but a girl has to do what a girl has to do! Thanks John. 2) I have the crud, as well.Ick! 3) Most importantly, you now have that damn song playing over and over in my achy head…. doo wop and all. I’m sorry to hear that you have a cold and hope that yours does not last weeks. Stay warm and get your much needed rest. Admire the fact that despite your cold you still took the time and extra time at that (darn Luxardo) to create this Blue Moon cocktail. It’s lovely and the name is a great one. Hope you did curl up under the covers and sip on this. Feel better soon.